Pollsters in the United States have come under scrutiny because nearly all predicted Hillary Clinton would win the White House. Among them was the author of The End of White Christian America. Undergirding the book was the same data that led many to believe the country’s growing ethnic diversity and burgeoning secular population would reject Donald Trump. Like many others, Robert Jones missed the mark. Writing in the New York Times after the election, he concluded that white Christian Americans “swarmed to the polls to elect as president the candidate who promised to make America great again”; the man who would “turn back the tide of cultural and economic change”. Ironically, as America’s general population has become less religious, worship attendance has remained constant, with the large majority (70%) reporting that they attend worship either weekly (37%) or at least occasionally (33%), as shown in the chart below. Another sign of the resiliency of American religion is that the majority of US adults who say that religion is very important in their lives has remained high – over 50% – over the past couple decades, as shown in the chart of Gallup polling below. So even before the election, the data was there for all to see: religion remained a powerful force. And in the November election, the exit polls showed that 81% of white evangelical voters voted for Donald Trump, effectively carrying him into office. All these trends coexist with the increasing number of people who are religiously unaffiliated, or who have no particular religion. According to Pew, this portion of the population, also called the “nones”, accounted for 23% of the adult population in 2014, up from 16% in 2007. Yet, Pew also projects that the non-religious demographic will account for only a quarter of the US population by 2050. This is because it is expected to grow more slowly in years to come, largely due to higher birth rates among the religious population. The mistake is to assume that the current trend towards a larger secular population means that religion is giving up the ghost. As shown in the below chart, the data indicates the opposite. 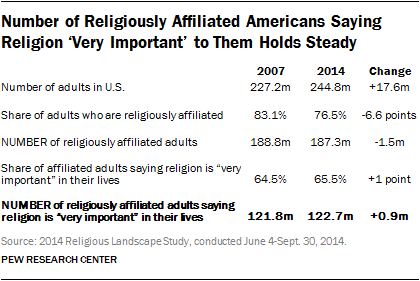 The number of Americans who are highly engaged with their faith has not changed very much. The blind spot here is misreading the decline in American religious identification as being equal to the decline in the power of religion as a public and private force. Aside from election surprises, there are important economic reasons why secular society shouldn’t ignore religion. 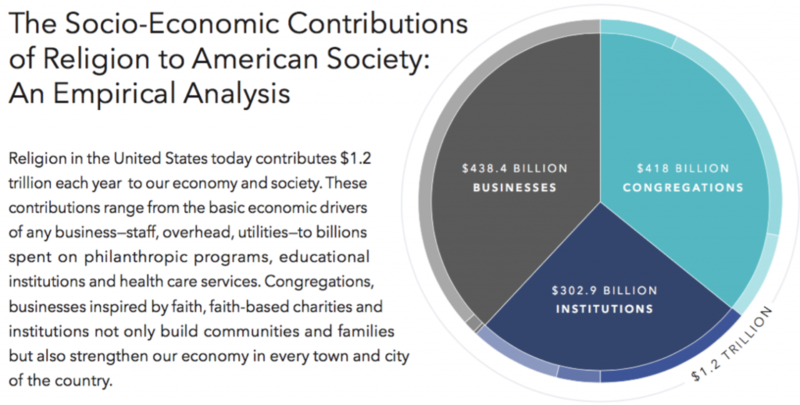 According to a recent study by the Religious Freedom & Business Foundation, the total economic contribution of religion in America is nearly $1.2 trillion, equal to the world’s 15th largest economy. Perhaps the most surprising business included in the study’s tally of religion-inspired businesses is Walmart, the world’s largest company by revenue, which employs 2.2 million worldwide. The religious roots of Walmart are cogently described in a book by Professor Bethany Moreton, who documents how one of the most rural and underdeveloped US states could produce one of the world’s largest and most tech-savvy companies. The secret, according to Moreton, was creating a new service economy based on the religious sentiments of Arkansas that equate serving others with spiritual virtue. Many early employees and managers saw, as her book title suggests, that To Serve God and Wal-Mart is a simultaneous venture that led to the making of Christian free enterprise. While the Religious Freedom & Business Foundation study does not classify Walmart as a Christian company, or even a faith-based company, it recognizes that religion was an important element in its creation. Without the specific religious milieu of Arkansas in the 1970s and 1980s, the service economy may not have become what it is today. Notably, Arkansas is part of the American heartland sometimes demeaningly called “flyover territory” – the red Republican centre of the country that coastal elites must fly over to travel between east and west coasts. It is one of 27 states in the US with fewer religiously unaffiliated people than the national average (the average is 23%; in Arkansas it’s 18%). Of those 27 states, 21 voted for Trump, including Arkansas. This is a cautionary tale for secular investors who might mistakenly think that the so-called flyover states are not economic dynamos yet to be awoken. It seems that the red centre of America is stirring, and along with it a new generation of business innovation may blossom. Only time will tell.